The concert of Sting at Firenze is one of those I will remember for a long time. One of those rare occasions when, whilst listening to the show, you forget about the kick drum microphone, the multi-band compressor, calculations and measurements of the acoustic prediction software, simply because you’re taken away by the music, totally immersed and surrounded by a pure, natural, engaging sound. Just balanced. This fine touch was given by sound engineer Howard Page, a soft-spoken Englishman and an old hand at engineering, with many certainties explained with simplicity and modesty. Taking a closer look, to deliver quality audio to the public with such an incredible band on stage (Vinnie Colaiuta on drums , Sting on bass and vocals , David Sancious on keyboards … need I go on? ), a first class sound system like Outline GTO and an experienced technical team is perhaps the very minimum expectation. But offering a solid, vibrant and passionate mix is something else, considering that the average sound pressure of the evening was around 96dB, to put the “punchers” at ease. But technically, what made the mix so sensational? First of all was the natural purity of sound, no doubt an accomplice to the sound system, GTO, which turns features into strengths. Second is the management of the dynamics, exciting as they should always be, and in conclusion, perfect in the low-frequency range. With all this, and after a long time of searching, I was able to listen to a bass drum that sounds like a real bass drum, alongside perfectly focused electric bass, with a warm, responsive sound enabling distinguished harmonic support to the arrangement of the song. All this rather than a generic, hyper-compressed “rumble” in the background, that seems to be fashionable nowadays. And I make it no secret, that at the end of the concert I jokingly thought to myself – “Well, the lesson is over, let’s hit the hay”. I’m sure some of the colleagues that were present in FoH did the same. Mr. Howard Page, FoH engineer. ZioGiorgio.com: During the sound check, I experienced a very smooth and natural sound. Is this the sound that you usually look for this kind of performance? Howard Page: Yes. I do the sound a little bit differently to many people. I am looking for perfect clarity and definition. I tune the PA a special way, which is very smooth and very flat, like studio monitors. This takes away any softness or harshness from the sound, and makes it perfect for the audience. The audience for Sting is a little bit older, and the secret to good live sound is to know your audience. You make a decision based on them, so for Sting, the sound is not run like it would be for a heavy rock gig for a younger audience. ZioGiorgio.com: Talking about low end. I experienced a very strong but very tight low end. Howard Page: That is another secret of the system tuning. When I put the bass notes out, I only want them to be as short as possible – Short and tight. The way to achieve this is not to bias the PA tuning towards the long end, and not have it too strong. There must only be a small shelf below 100Hz. But the trick is that you don’t let that shelf go above 125hz, because the musical instrument summation is between 100hz and 500hz. If you look at a chart of all the musical instruments and their frequency ranges, you will see that most of them have a strongest frequency range between 100Hz and 500Hz. So you must be very careful when you tune a live sound system that there is never too much in this area, because when I turn my very smooth and flat mix up, I will get too much between 100Hz and 500Hz. 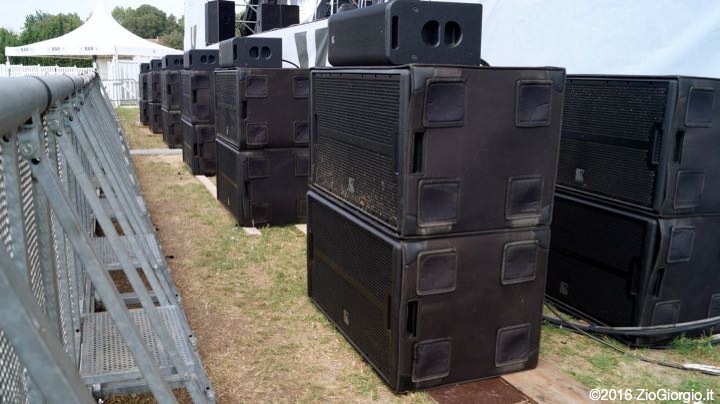 Many larger line array sound systems have tuning which has a big boost from the bottom end right up to 2000Hz, and then rolls off. Those systems are sometimes set that way at the factory, but this often loses the clarity because of the summation of the instruments, with the mix itself giving you too much of this frequency range. ZioGiorgio.com: What do you ask of the PA system that you are working with? Howard Page: This is only the second time that I’ve worked with the Outline system, but how I tune a system works with any sound system, if you put the time into tuning it. I teach my techs at Clair Bros how to use this technique across the board. The boost from 100Hz down must only be 2-4dB, but never above 100Hz, because you lose the clarity and overtones of the instruments. The Outline system works great with the techniques that I have already mentioned, and the settings available have enabled me to easily achieve a smooth and natural response across the entire frequency range. The guys have done an amazing job here. I’d like to pass my thanks to them for their great work on the settings, and the excellent coverage that the system gives across the entirety of the venue. ZioGiorgio.com: Your approach with the console is more of a studio approach, as you are using a studer console which is quite an unusual choice for live work? Howard Page: Yes I agree that it is an unusual choice, but probably because it is an expensive option. I worked with Studer to design this console for Live work over the course of a year, visiting Switzerland as an advisor and consultant. I have built many live consoles over the years, and analogue is my specialty. The studer console is possibly too much of a console for many people. It has many configuration options, unlimited patching facilities, and you can do pretty much anything on it. The reason it is so expensive is because it has all of the studio preamps and electronics, which makes it completely different to the other consoles available on the market. This is why I love it, but my approach is not so much studio, but rather my preference is not to put any bias on the system. I have designed many systems as senior engineer at Clair Bros, and you learn over the years what makes it clean and clear for a big audience, especially inside an arena. The system must reproduce what is coming out of the console. When I set up my measurement equipment, I am looking for the reference channel to be a mono mix out of the console, and the unknown channel is the reference microphone. I want the two to line up so that I know that what is coming out of the mixing console, is what is coming out of the sound system. If you don’t tune a big system properly, you leave it tilted, and all your mixing channels become bias to the low-end boost. I don’t want this. If I want this boost, I do it with my EQ. This also makes the mix perfect for sending to broadcast. Although I do use compression and processing within the studer, I only use a little bit of compression on the vocals to hold them in the mix, but not on other elements of the mix. I have already fixed any problems by how I have tuned the PA.
ZioGiorgio.com: Some say that in a bigger venue the system must be working in Mono as opposed to Stereo, would you agree with this? Howard Page: I like the system to be stereo rather than mono, but I only do a small amount of stereo imaging on for example the toms of a drum-kit. 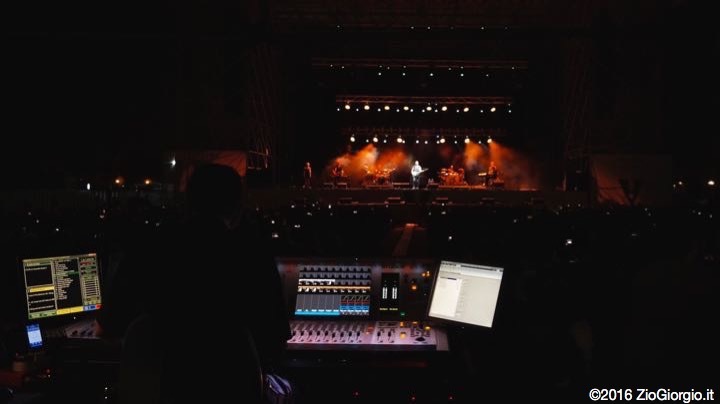 However when working outdoors especially, and in larger venues, you must be very careful with how you use stereo imaging. It is often the case that only the middle block of the audience will get any stereo image presented to them. I’ve done many experiments with side-hangs, and these really need to be mono. If I did the drums in a stereo mix, the people on the right are only going to hear half of the stereo image because they are only hearing that side-hang. And the mono mix should be precise, at -6dB for the sum, so that the level is the same. It is also important to work the time offset to be correct between the main system and the side system, as once you move past the side-hang and further away, the audience is no longer receiving the sound from the main system. You must always think that the people who have bought their tickets for the side must receive the best sound they can, but it will only be in mono, because they are only really hearing the one stack. The system here today was perfectly tuned for this, to give them the optimum clarity. I have no bias on sound systems. Tomorrow, a different show, a different sound system. When you are a real sound engineer, you walk into any type of sound system, and if you know your craft of tuning, optimizing and balancing the sound, you will have no problems. I use a special click track that I can use to walk around the venue to, and time the system until I hear a single clicks and no ghosts. ZioGiorgio.com: How do you work with the front fills? Howard Page: The key is to get the big powerful sound from the main system, and the clarity and detail from the front fills. On the front fills, I roll these off from 200Hz down, because this is not clarity. I’m using delay to just get the clarity from these front fill units. So many big shows are ruined by too much of the low frequencies. You mentioned about my kick drum being tight. This is because I can have this as loud as I like without it interfering with any of the other instruments. If you have a kick drum sound that is too long, when the music is in 4/4, the sound spills across the timing. You want the kick drum to fit naturally into this beat. In bad venues or in a big arena you might want to gate the drum, but this isn’t usually necessary. When I work in these arenas, I turn the subs all the way down, and tune the main system. I then bring the subs back in, quietly at first, until they act as an extension of the sound. Many big festivals have the subs far too high in the mix, which just adds to the kick by false tuning of the PA. This isn’t how I work. If I want the kick to be big, I achieve this in the mix. That way, when it is recorded, it’s the same as for the live. It also means that you don’t need to apply tons of EQ onto every channel to remove the low end being boosted by the PA system. That is the secret of clean musical clarity. I believe in selling the show to the audience using dynamics, from the big to quiet songs. Especially with Sting, who we refer to as a “Legend Act”, you give the audience the sound that they expect to hear when they buy the ticket. Sting and I have many years experience of working together. When we did the orchestra shows, it was essential to get these dynamics right, because when working with an orchestra you cannot simply keep turning them up. If you do this, you might as well send them home and get a keyboard in, because you lose all of the clarity and texture through unnatural amplification. ZioGiorgio.com: Finally, many people these days experience music “incorrectly” through small earphones and on their cellphones. What do you think about this? Howard Page: Well the main problem of course is the source material. Many are listening to MP3s that are of a low quality. This means that people don’t always know what good quality sound should sound like. However with most of Sting’s audience, they do know, because they are used to experiencing the songs on better systems from CD format or another physical medium. You give them what they remember, and they leave happy. Not because it is necessarily the “greatest sound ever”, but because it’s what they think to show should sound like. Just before the concert we exchanged a few words with Angelo Catoni, the owner of the service company Emporio On Stage in Scandicci , Florence . ZioGiorgio.com: Angelo, welcome, what is your role in this event and what have you deployed in the field? 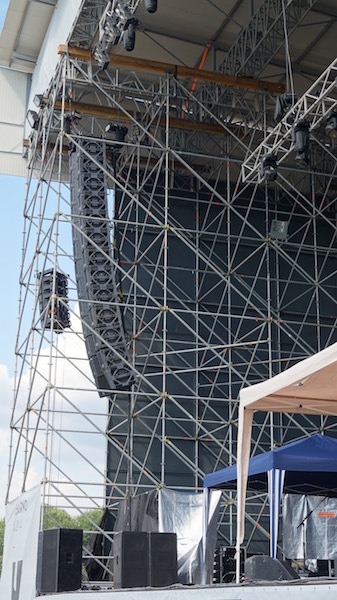 Angelo Catoni: I am the owner of the service company that provides the audio material, lighting and structures, and as this year’s novelty we provided the Outline GTO sound system we purchased recently. 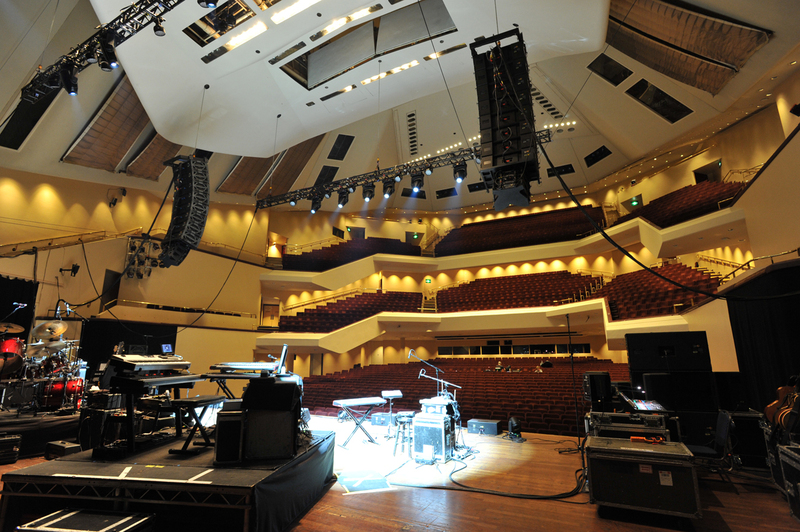 Together with Outline we designed the sound system, and time after time we focussed on providing the “ideal ” system for the production’s needs: for example, with Massive Attack we favoured and strengthened the mid/low range and on this occasion we’re looking for a response as natural as possible. ZioGiorgio.com: What feedback have you had from the various productions about the audio? 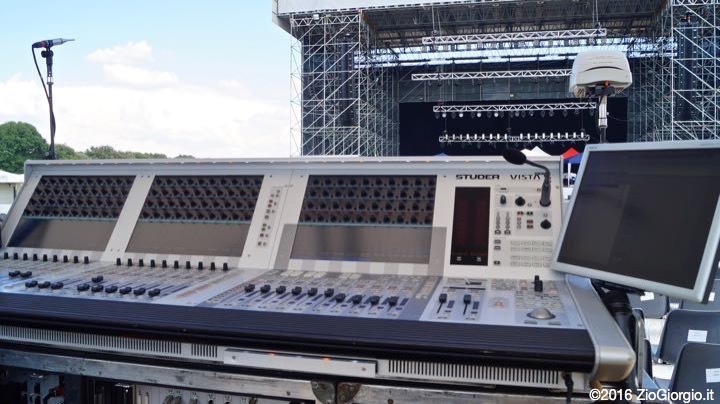 Angelo Catoni: I would say very good, although for foreign productions GTO is not a newbie, many have used it all around the world, while in Italy I saw very pleased technical crew members, curious and collaborative. A good sign. ZioGiorgio.com: You work with very different productions, both Italian and foreign, which are the most difficult situations to handle from your point of view and based on your role? Angelo Catoni: They are all of high standard and in some situations, as in this case, are very demanding and with a very high level of professionalism, the best of the best as in this case. I must say that I am happy to note that we can keep pace by providing equipment and a service aligned to international standards. 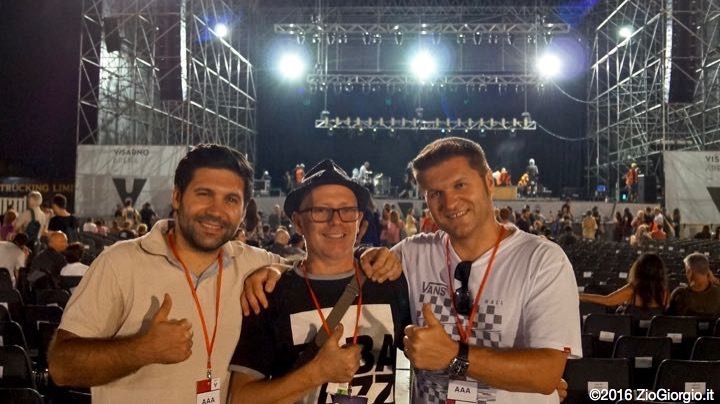 Then let me tell you – and it’s a badge of honor – to have an Italian sound system, with Italian amplifiers ( Powersoft ) and managed by an all Italian technical crew gives even more satisfaction! ZioGiorgio.com: Quite a brave choice to be the first in Italy to buy such a large system and not fall on one of the two or three brands with years rooted in the business. But above all I would like to know how a service company owner like yourself comes to make such an important and expensive choice! Angelo Catoni: The first reason why I’ve chosen Outline GTO is because I am convinced that it’s at the top, or at least at the same level of other systems we all know. On the other hand I must confess that there were a series of events that led me to take this route. Two years ago I started my quest to buy a sound system that would allow me to further raise the quality offered by my service company and I started searching, still looking at the top of the range. I’ve listened and I’ve heard many different opinions, and among them was a very positive one about the Outline system, by a person of whom I have great confidence and esteem, Andrea Taglia, perhaps among the first who had used and appreciated it with Andrea Bocelli. Another product that I wanted to introduce in the audio section of my services were Powersoft amplifiers, that I have considered for many years to be the best product on the market. Coincidentally, GTO uses Powersoft amps. But I made the final choice in December 2015, when I momentarily returned from England, and was able to test the system on the field along with the Outline team, with which I established an excellent relationship right from the word go. from the left: Lorenzo Sassi, Outline’s Business Developer, Angelo Catoni and Luca Giaroli. Taking advantage of another pre-concert moment to listen to the opinion of Luca Giaroli, from Outline, which together with the Outline audio team and technical crew of Emporio On Stage has planned and implemented the sound system at the Parco delle Cascine (Cascine Park), a monumental and historical park in the city of Florence. 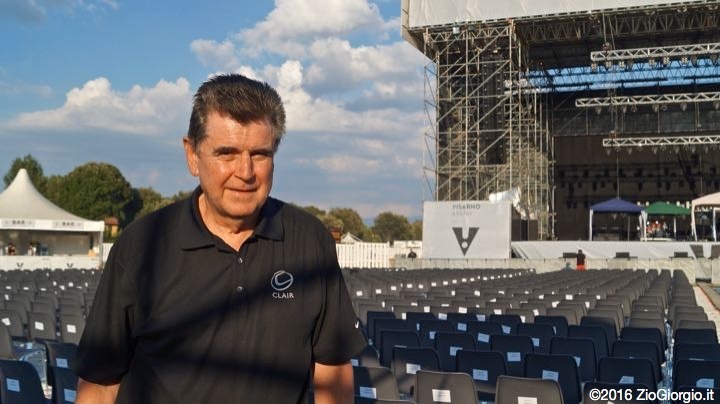 ZioGiorgio.it: The Sting concert seemed ideal terrain for GTO . The sound engineer Howard Page thanked you and changed next to nothing of the set up you prepared. From where did the audio project start and what was the path followed to achieve this?. Luca Giaroli: GTO is a mature project, thanks to the many international experiences today we have presets to propose to the PA and sound engineers as a good starting point. Howard Page, as he expressly told us after the first listening, just made the balance between the channels (especially sub and bass ) according to the standards that the rest of his setup provided, and checked that the alignments that we proposed were to his liking . Howard, an example of pure professionalism, passion, humility and kindness, has clearly said that after a lifetime spent in the pursuit of ” perfection”, he realized that the first feature to look for in a “live ” system is the intelligibility. and said that the GTO today is certainly among the systems on the market that meets this requirement at its best. ZioGiorgio.com: I observed that the Outline GTO has finally “landed” in Italy and is hitting prestigious stages. What has happened in recent times? Luca Giaroli: At the beginning of 2015 Outline has invested heavily in “fresh and new forces” and “visibility” and this allowed to follow more effectively all distributors and business partners around the globe. Italy was no exception and, thanks to the direct knowledge of the market that I have refined over the eight years of my previous adventure, it was natural and very pleasant to be able to know and appreciate the quality and reliability of Outline products. This “new wave” has also allowed us to reap the rewards of the hard work that Luigi Lombardi and Mods Art (official distributor for Italy ed) have done over the years and today, with the addition of James Laria to the team, they’re really ready and equipped to better serve the Italian market. 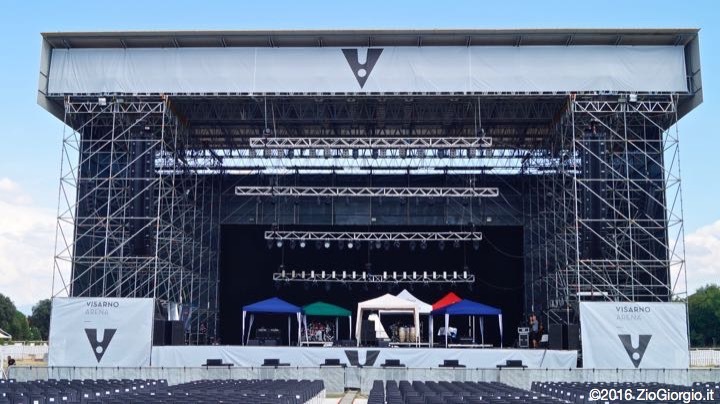 We have stood on important stages in Italy due to the great work that Italian companies such as Emporio On Stage, Soundtech, DG System and many others thanks to the quality and credibility of our systems and by virtue of a natural and fruitful collaboration between these companies and Outline.